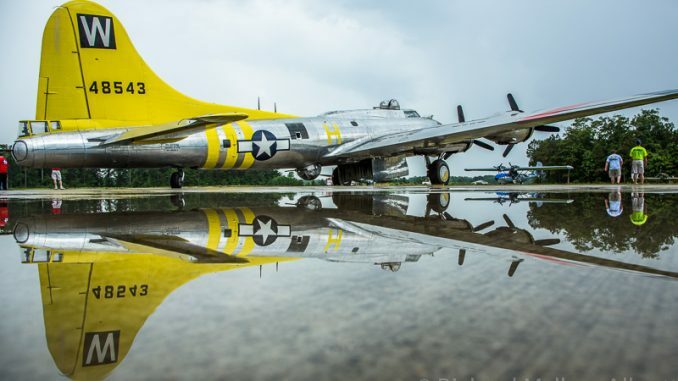 “Nothing stays the same for ever”, as the saying goes, and the time has come for the Boeing B-17G Flying Fortress known as “Chuckie” for over three decades to receive a new name. She will soon become “Madras Maiden”, which might take a little getting used to for some, such was “Chuckie’s” fame. The late “Doc” Hospers, who bought “Chuckie” in 1979, named her after his wife, and because of that connection the B-17 sort of took on a life of its own. This connection continued even when Hosper’s widow sold the Fortress to Jerry Yagen in 2010, as he assured the name would remain for as long as he owned the Fortress. 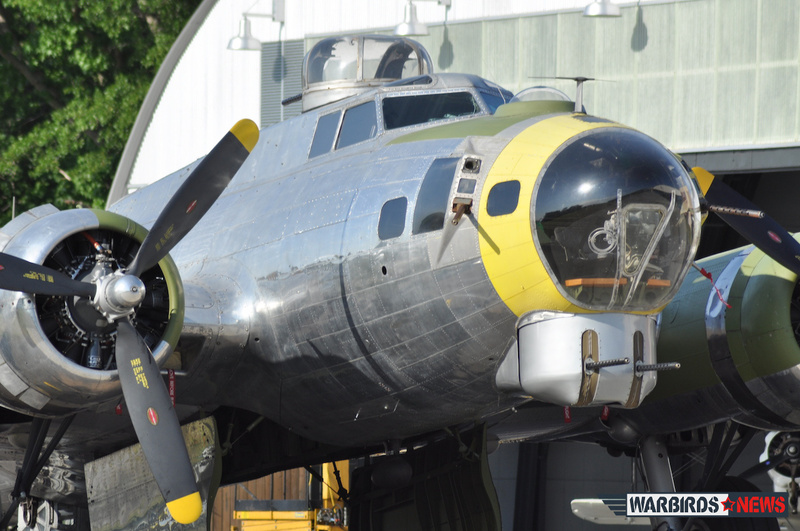 However, Yagen sold the B-17 to Jack Erickson last year, and the Fort’ made her way out to Erickson’s marvelous collection in Tillamook, Oregon. Erickson will soon move his aircraft to a new base in Madras, Oregon. 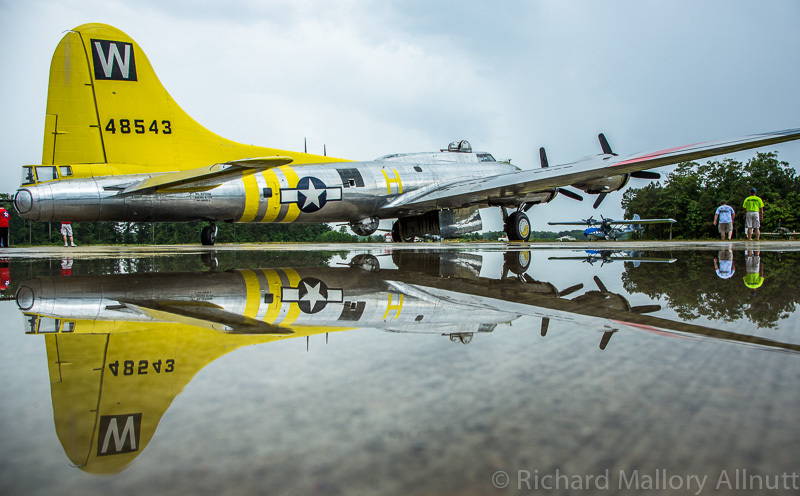 Because Madras served as a primary training based for B-17 crews during WWII, some of the museum volunteers felt that renaming “Chuckie” to honor those crews would be a fitting tribute to their sacrifice, and it’s hard to argue against that. Jack Erickson agreed, and that’s why this summer noted aviation artist and nose-art historian Gary Velasco will travel out to Madras to paint the new name and artwork on the B-17’s fuselage. In a recent interview, Velasco told WarbirdsNews, “The new nose art and name will be “Madras Maiden” with a pinup. I will go out there in June to do this and will document along the way with noted photographer Lyle Jansma who was instrumental in putting this whole concept and deal together.” As one of the top aircraft nose art specialists in the country, Gary takes great pride in his painstaking efforts to accurately render historical markings so as to preserve and teach future generations of the enormous risk and sacrifice made by American aircrew during their service. An Artist, author and musician, Velasco runs Fighting Colors, a small company that specializes in producing the finest nose art products on aluminum panels which closely resemble skin from an actual vintage warplane. These vary from small-scale replicas to 12 foot full-scale hull sections. He has also painted the nose art for many warbirds currently flying, including the Commemorative Air Force’s B-24A Liberator, “Diamond Lil”. 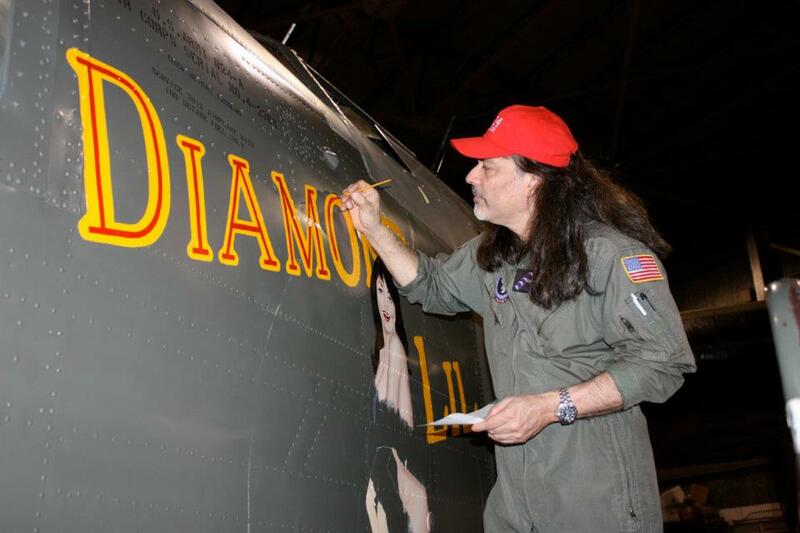 Gary Velasco painting the nose art for the CAF’s B-24 “Diamond Lil” during her re-paint a couple of years ago. “Madras Maiden” will be a flying representative for the community of Madras, Oregon and the Erickson Aircraft Collection while touring the Pacific Northwest and visiting regional air shows and other aviation museums. Jack Erickson and his museum manager Mike Oliver both agreed that the new name made sense. Community Leaders in Madras, Oregon have also embraced the idea as well, and have even gone so far as to donate $5000 towards the new nose-art. 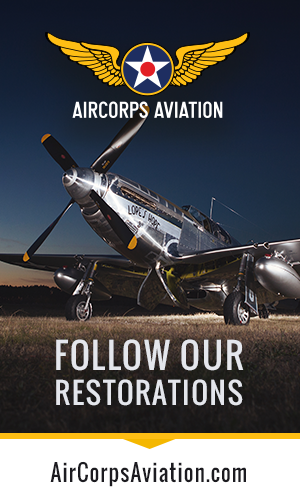 They are excited to have the Erickson Aircraft Collection relocate to their small town, and are dedicating a monument to the Madras Army Air Corps base this August nearby two of the original B-17 maintenance hangars built during WWII. So big things are happening out west, and while some might be sad to see “Chuckie” changing her name, her story will always be remembered. As “Madras Maiden” the B-17’s future seems bright, and full of renewed purpose. We at WarbirdsNews look forwards to seeing what creations Gary Velasco comes up with for her new artwork as well. I think the plane should be named after a actual B-17 that served during the war instead of a name that was made up. It would be best if the aircraft was in the colors it flew in during the war. When you think about it, this is no different than an RV-8 wearing D-Day invasion stripes. It seems like most warbirds these days sport whichever paint scheme or name that the owner chooses. I don’t welcome the name change, but if you are going to go that far, might as well repaint the entire airplane, and do it to a historic scheme that this plane actually wore. Not enough warbirds out there wear a true historic paint scheme, and most have to seemingly have to have a “red tail” or be of some historic plane that was never in that specific airframes lineage. I’ll end by repeating what I originally said, this new paint scheme is in a sense no worse than an RV-8 sporting invasion stripes. Lets just hope this isn’t an omen, and that they drenched the aircraft in a virgin woman’s piss before the name change (like when you rename a boat). I can understand the sadness and resentment that people feel about this name change, but obviously you people have no idea who the owner (Jack Erickson) is, and what he has done to preserve what all of us here so admire and love, WW2 aviation history. The Erickson collection is by far the most impressive WW2 aircraft collection I have seen, all planes are in top flying and pristine condition. The name change isn’t some lame fantasy scheme the owner has dreamed up either, it is in honor of Madras Oregon, a B-17 training base during WW2 and the men who served there during this time. I am very well aware of who Mr.. Erickson is and what he has done. That has no bearing on anything, your comment brings nothing to the coversation. Gerry Yagen, Kermit Weeks, Rod Lewis, Paul Allen, and a few others with deep pockets and a passion for aviation have done the same. Your assumption is misguided. Interesting. You still just don’t have the guts to publish something that I wrote about a tribute towards the Hospers family and the family of volunteers that helped rescue this plane from the razor blade factory. So sad that Erickson won’t put something of tribute on the plane showing tribute to the Hospers. Oh well…. We are still with the museum and that is a horrible thing to say about Doc’s wife, you are a nasty person. Glad your gone! Been with them for over 20 years and never has anyone been so ugly as you are being. I was on the ORIGINAL crew (from when Doc first brought her from Dothan to Ft. Worth). I honestly can’t remember ANY of us EVER expressing an opinion like the one you describe. It’s regrettable that you have such a miserable attitude and you are welcome to it. But you CANNOT apply it as a generality to all of us. I’m a big B-17 fan since 12 O’clock High days. Would be nice if in historically accurate paint but owners can paint their planes however they want. It’s a small miracle that some of these warbirds still fly at all and I for one am not overly concerned with the paint scheme fitting my personal tastes. Keep ’em flying! The plane’s name is what it is but could the aircraft at least have authentic squadron and group codes? These birds are living history and for historical accuracy purposes they should at least have the correct codes. There were no JE coded squadrons in the 8th AF and especially the 381st BG as the Triangle L depicts.